The Beverly Hills mansion where famous scenes in both “The Godfather” and “The Bodyguard” were filmed, and John and Jackie Kennedy's honeymoon home, is for sale and featured this week at TopTenRealEstateDeals.com. One of California's most famous mansions, William Randolph Hearst's Beverly House, is for sale at $135 million. William Randolph Hearst was a brilliant visionary whose accomplishments spanned magazine and newspaper publishing, movie newsreels and radio. Now remembered more for his over-the-top real estate holdings than his business acumen, he owned two of the most fabulous properties in the United States: Hearst Castle in San Simeon, California and the Beverly House in Beverly Hills where he lived with actress Marion Davies. The Beverly House estate is now for sale priced at $135 million. Well known for its memorable movie scenes in “The Godfather,” where the uncooperative movie producer Jack Woltz woke up to a horse head in his bed, and the glamorous estate where Whitney Houston’s character lived in “The Bodyguard,” the mansion was a favorite of the Kennedy family where John and Jackie spent part of their honeymoon and later the West Coast presidential election headquarters for JFK’s 1960 presidential campaign. Designed in 1927 by Gordon Kaufmann, the architect who did the Hoover Dam, Hollywood Palladium, Los Angeles Times building and Santa Anita Racetrack, Beverly House is the quintessential emblem of Hollywood’s Golden Era. The estate is well known for its H-form architecture characterized by long colonnades, wide balconies, arched floor-to-ceiling windows and its spaciousness. Some of the spaces include a stunning two-story library with hand-carved paneling and a wraparound walkway; a formal living room with its 22-foot-high, hand-painted, arched ceiling; a state-of-the-art spa; a billiards room with herringbone parquet floors and an intricately designed ceiling and carved fireplace - both from the Hearst Castle in San Simeon. The grand upstairs hallway is more than 102 feet long and features a 40-foot wide, nearly 9-foot-tall Dennis Abbe mural that was commissioned by Hugh Hefner. The gardens, designed by landscape architect Paul Thiene, are a focal point including cascading waterfalls to the pool. Located only three blocks from Sunset Boulevard and the Beverly Hills Hotel, Beverly House is sited on 3.5 acres at the end of an 800-foot-long driveway with 19 bedrooms, 29 baths, a near Olympic-size swimming pool, lighted tennis court, two projection/screening rooms, a commercial-grade kitchen, terraces to accommodate 400 or more guests for a seated dinner and grounds to accommodate more than 1,000 people. Set on its own promontory, Beverly House consists of approximately 50,000 square feet and in excess of 35,000 square feet of living space while guaranteeing extreme privacy and security behind its guard, house-gated walls. 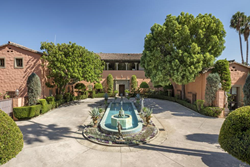 Located in the heart of Beverly Hills, the fabled Beverly House of Hollywood’s Golden Era and the showplace of publishing magnate William Randolph Hearst is listed by Jade Mills of Coldwell Banker in Beverly Hills, priced at $135 million.